By unequivocally knowing the prerequisites and requests of our benefactors, we are acutely submerged in offering Customized Sheet Metal Enclosure to the supporters. These Customized Enclosures are made from high quality of raw material which ensure durability at its user end. These Customized Enclosures are appreciated by large number of clients. These products are available in market at economical rates. We also manufacture custom-built enclosures for UPS applications, sound proof canopies for Compressors and DG sets, Display units, Billing Kiosks, to name a few. Electrosoft supplies custom built solutions to Control Panel Manufacturers who need specially designed enclosures to meet specific requirements. 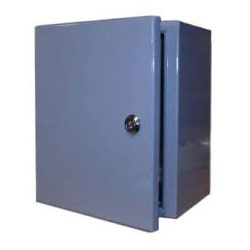 We suppply enclosures with special fittings & accessories and sizes to match your specifications. Our Enclosures are CNC Fabricated and 7 tank process powder coated so as to assure Excellency on your ultimate product.